Louise from Table Tonic inspired me to write this post today when she posted this image from Kelly Wearstler's book "Hue" on her blog. 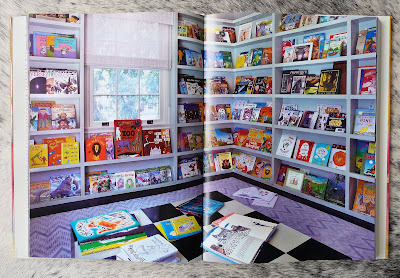 I'm sure many of you have seen this library room before, possibly when it was featured in Cookie magazine (image below) last year before the magazine closed. This library/playroom is a wonderful idea, only if we all had an extra room in our house just for children's books. 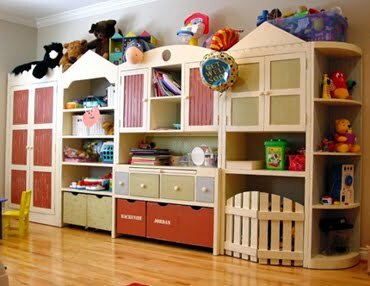 But you can take the concept and possibly just do one wall in your playroom with build outs up to the ceiling (more for effect than for functionality) and have a low table in the middle for crafts. I also ran into the photo below from Kelly's previous home. 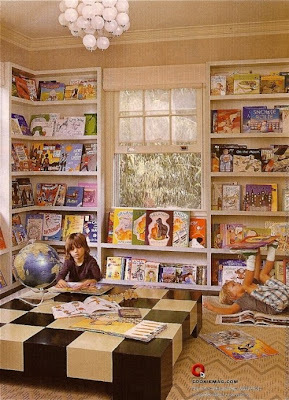 As you can she came up with the "bookstore" concept of displaying children's books well before the library above was created. 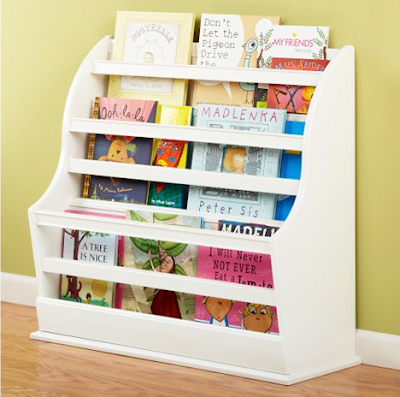 Having books open-faced makes them more appealing and visually stimulating to your children. Another designer Anna Spiro of Absolutely Beautiful Things used this same concept but turned it down a notch. This would be a pretty easy buildout for any carpenter. I like the window seat which doubles as extra storage. Now back to dramatics, for the more modern home. 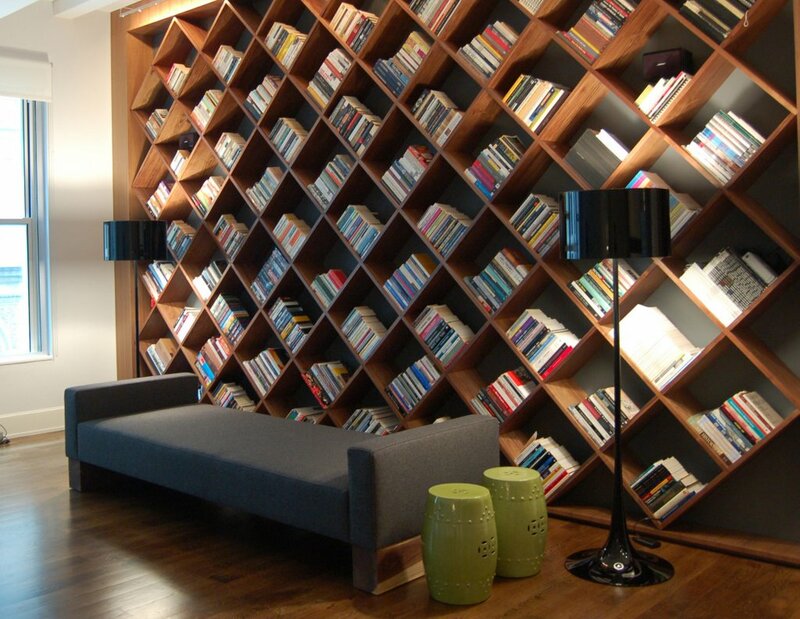 I like this idea of a slanted bookcase encompassing a whole wall. You need a good carpenter to do this but kids will think it is fun to put books in all the different slanted pockets. Who knew picking up could be so much fun! Or if you are out of floor space, I like these holders to create a pop on the walls. 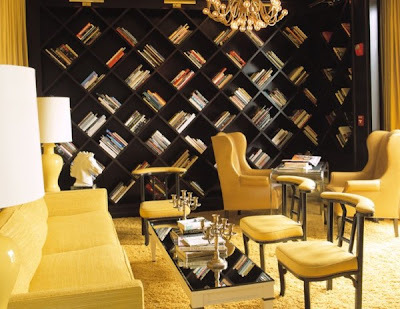 These not only hold books but create some interesting visual interest and a pop of color. Get a few of these to run across an entire wall and you can get a similar library look for a lot less than custom. Oh yes, I love these. Want to do built-ins for our new playroom. 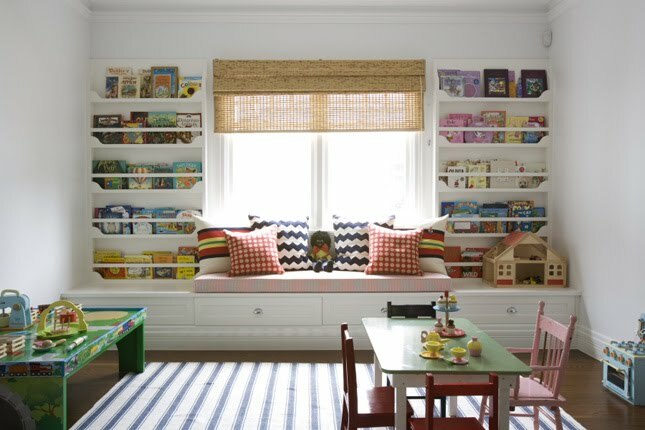 But I'm absolutely in love with the bookshelves on the side of the window seat - wish we had room to do that. Oh yes your collector's shelves are perfect! 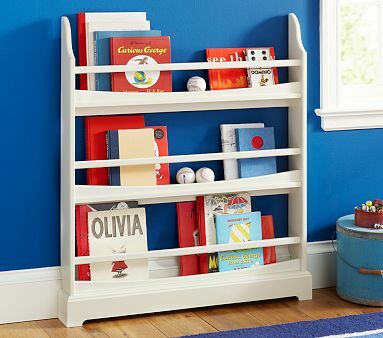 Off the floor and keeps everything so nicely organized! i love the fourth photo..the book shelves, pillows and rug are all perfect. first time on your blog and I'm a new follower..